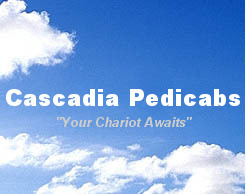 Eugene Cascadia Pedicabs focuses on providing great, fun, and friendly pedicab transportation in Eugene. Please call us at (360)510-1818 for special events, sporting events, and Weddings! We do not provide nightlife service at this point.